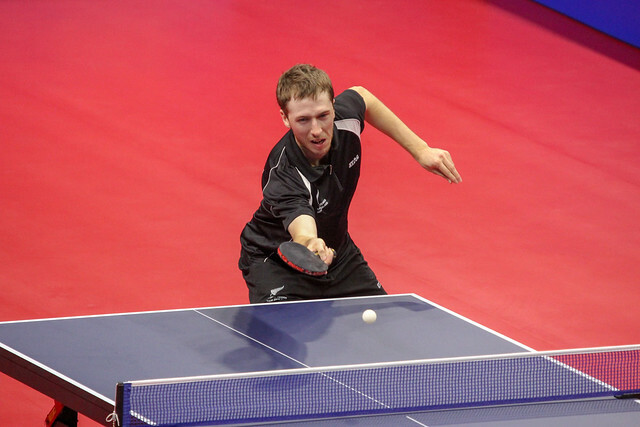 Testing times for Australia when competing in the recent 2018 ITTF Team World Cup in London when faced with the might of Asia and Europe; on home soil in Gold Coast it is proving a very different story. After three days of competition on Saturday 17th March at 2018 ITTF Oceania Championships, the colours of the green and gold have enjoyed notable success. However, progress has not been with trials and tribulations. Notably in the Under 21 Men’s Team final, Ben Gould and Rohan Dhooria suffered a three-one defat at the hands of New Zealand; the Kiwi to excel being Dean Shu, he beaten both Ben Gould (11-8, 9-11, 11-5, 9-11, 11-7) and Rohan Dhooria (9-11, 11-6, 3-11, 11-8, 11-6) to prove the mainstay of the three-one win. Defeat for Australia but in the counterpart Under 21 Women’s Team final, it was a very different story; Danni-Elle Townsend and Parleen Kaur overcame the combination of New Caledonia’s Solenn Danger and Lorie La by three matches to nil. Meanwhile, after the conclusion of the group stage of fixtures in the Men’s Team and Women’s Team event, Australia occupied first place; on Monday 19th March, the top two teams meet to decide the title. In the Men’s Team competition New Zealand provide the opposition, for the women it is the combination of New Caledonia’s Solenn Danger and Lorie La who join forces with Tahiti’s Melveen Richmond. Success for Australia in the team competitions, as the individual events commenced, the country’s leading names enjoyed success. In the Men’s Singles event Hemming Hu, Yan Xin, Kane Townsend and David Powell duly topped their respective groups, as in the Women’s Singles competition did Jian Fang Lay, Melissa Tapper and Feng Chunyi. Similarly, in the Men’s Doubles competition, Heming Hu and Yan Xin are through to the semi-finals where they meet New Zealand’s Dean Shu and Alfred Dela Pena; in the opposite half of the draw David Powell and Kane Townsend oppose Tahiti’s Alize Belrose and Bydhir Carnet. Podium finishes guaranteed, in the Mixed Doubles event all four steps of the podium are guaranteed for Australia. At the semi-final stage Yan Xin and Jian Fang Lay meet Kane Townsend and Micelle Bromley; Hemming Hu and Melissa Tapper oppose Trent Carter and Feng Chunyi. Play for the leading pairs in the Women’s Doubles event has yet to start. However, in the Under 21 Men’s Singles first stage, there was a major challenge from New Zealand, Dean Shu, Alfred Dela Pena and Nathan Xu all topped their first phase groups; the one Australian to gain such success was Rohan Dhooria. Play continues on Sunday 18th March, with the individual events progressing to the later stages; additionally the Men’s Doubles, Women’s Doubles and Mixed Doubles events in the Under 21 age group, competitions in which the leading pairs have yet to enter the arena, will be played in entirety.